And.... I've included my own book (but still give you TEN others) as literally, its EXACTLY what I dig in tiny housing, and stands as a long-built culmination of all my own inspirations, influences, and nods to bits and parts from the books I loved, and read, while growing up.....so, yeah, it definitely is in my top ten, as it represents everything I like in tiny housing and designs. 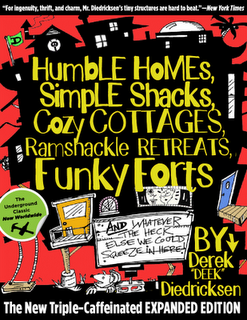 So....Deek's/Relaxshacks.com's TOP TEN Tiny House/Cabin/Vacation Cottage/Micro-Architecture Books....(well, again, ELEVEN). This (out Feb, 1- 2012- but out for pre-order for a REALLY low price (Ouch!)) is the EXPANDED, and updated version of my still-available hand-assembled book (order via this blog- right hand column). The new edition will have several new cabin ideas, designs, and sketches, TWO color photo insert sections, a new chapter on small space design tricks from interviews I've done with Dee Williams, Kent Griswold, Duo Dickinson, Jay Shafer, Mimi Zeiger, Cathy Johnson, Alex Pino, Gregory Johnson, Tammy Strobel, Amanda Kovattana, Colin Beaven, (and more), a ton of new micro cartoons and additive/example sketches, a brand new intro/foreword by David and Jeanie Stiles, and then some. All in all, the book gives close to FIFTY cabin ideas and concepts to get your creative juices flowing. The "OLD"/current version of the book DOES have about 5-6 designs in it that won't be in the new book, and won't ever see the light of day again- so order the hand-assembled one while I have 'em- they all come signed too. David and Jeanie Stiles are an author/architect duo from NYC who have put out a slew of books on the tiny architecture subject over the years (and I do recommend ANY of them), but "Cabins" (with "Rustic Retreats in a close second) is my favorite of them all. The sketches are incredible, the ideas very solid, and it'll take a heck of a long time before you're bored perusing through this one. David and Jeanie have actually written a new intro to MY book- certainly an honor, as I think very highly of the two of them and their body of work. I can't speak highly enough of David's pen sketching style- very D.C. Beard, but with a fun, faster, more lighthearted feel. A virtual feast of funky photos, hand-built homes, and hippied-out, ultra-creative dwellings, all in a hugely eclectic, and seemingly random manor- making each page turn unpredictable in its content. This book is just LOADED with color photos, and visual snippets from other books, architects, designers, and "off-gridders".The HUGE color insert/centerfold photos of a recycled glass cave/dwelling, are art in and of themselves- just gorgeous. From stone homes to huts fashioned from re-purposed scraps and auto parts, this one has a little of everything. Like David and Jeanie Stiles, Lloyd's other books are pretty unbelievable as well- "Shelter" would be a close second of mine to "Homework" and its his best-selling work to date- with far over 300,000 copies having been independently moved. "The Barefoot Architect" is also phenomenal- put out by Lloyd's "Shelter Publications". Support the man. Dan Price's "Radical Simplicity" is probably the most offbeat, and fun entry in my top ten. Its presented in journal form, and not so much a cabin how-to, or carpentry tutorial book- actually its NOT at all. Throughout Dan's entries and his myriad of ultra-unique pen sketches, you gain insight, both in prose and in sketch, as to a large variety of the shelters Dan has built, lived in, and run his micro-publishing business from. Teepees, log huts, and underground kivas! (oh my!). Price's ideas and drawings are very quirky and unusual- one of the reasons I'm so fond of this little book. File under: Start Saving Your Money! Most of these cabins (and locales) are exclusively for the mega-rich and elite, BUT there's no denying the appeal that is within most of them, nor some of their unique approaches, concepts, and constructive ideas- which are ripe for re-adaptation to suit your own needs (on a more sensible budget, perhaps). Visually, its an absolutely beautiful book, and Mulfinger, a Minnesota-based architect, is not only passionate about the field of vacation cabins and camps, but damn knowledgeable. Not all the cabins within are so modest in size, some even bordering on semi-monstrous, but there are many, many gems within, and this one is well worth the coin for tiny house and cabin daydreamers and addicts alike. Dan also comes across as a very likeable guy you could sit down and have a few beers with- despite his being a very notable and successful author and architect. "The Getaway Home", and "Cabinology" by Mulfinger, are both very noteworthy additions to the subject as well. "Micro", much like "Small Houses" (below) has some of the more bizarre, and in some cases most illogical and artsy cabins and shelters I've seen- but even the "bad ideas" in this one are thought provoking and really serve to stretch the imaginative boundaries of form in function in scaled down living. A huge, and very stunning array of photos reside in this one- so its more of an eye-candy book- light on the text, but still BIG on ideas and open-mindedness. This is another one of the earlier books I had access to while growing up, and whether it be the hexagonal ski chalet with fold-down bunks, the micro cook-camp/sleeper, or the vacation cabin that spins to follow the southern sky (by means of a small motor and chain-driven system), I still find myself returning to this book from time to time- just to browse, and soak up all these wonderful, 1970s-looking locales, scenes, and design ideas- many of which are still VERY workable today. "Shantyboat" is a book I discovered by accident a few years ago, and devoured. Afterwards, I immediately set upon finding and reading every other book that Harlan (and Anna) Hubbard had written (sadly, only three, really). There are few pictures in this (printed woodcuttings of Harlan's), its a novel on the travel adventures of two daring souls, and its a fairly lengthy text-based read, but if tiny housing on the water (shantyboating, or houseboats) is your thing, you'll want to build one right after reading this book. Harlan and Anna, at the age of 50 or so (if my memory serves me correct) built a shantyboat from scrounged river wood and materials, and without the aid of a motor, proceeded to drift down the Ohio and Mississippi Rivers, all the way to the Gulf Of Mexico- over a period of several years. The tidbits of knowledge and discovery in this book are just priceless. The duos eventual homestead (later a book under the same title as well) "Payne Hollow" is on my list of MUST SEE places before I croak. ALL of their books are VERY worthwhile. See the above read on "Micro"- these two books are rather similar in style, size, and photographic array, and both cover the more sparse and modern angle/side of tiny architecture. Photos galore! Being a Boy Scout (Eagle Scout), I've grown up with D.C. Beard's timeless instructional sketches, and his just-plain-amazing pen and ink style of art and architecture. "Shelters, Shacks, and Shanties" is for the very earthy and old-fashioned sorts out there- showing several very bare-bone renditions of shelter the way it was made back in the days of our country's pioneers. Log cabins, lean-tos, teepees, wigwams/hogans- they're all in here- and most can be made with little more than an axe and a saw. Runner Ups....we'll get to those in another post at some point- but Mimi Zeiger's Micro Green is certainly one of them, and one of the few VERY newer books that I've really been impressed with.